Report on historical data in industrial historians and databases to produce key performance indicators, summary values and trends. In a matter of minutes you will be creating reports from GE Digital Historian, Wonderware Historian, DeltaV Continuous and Batch historians, Rockwell Software FactoryTalk Historian, Kepware KEPServerEX Local Historian, Canary Labs Enterprise Historian, any OPC HDA server and more. Create reports as workbooks, worksheets, pdf and web pages automatically on time, on process events or on-demand. 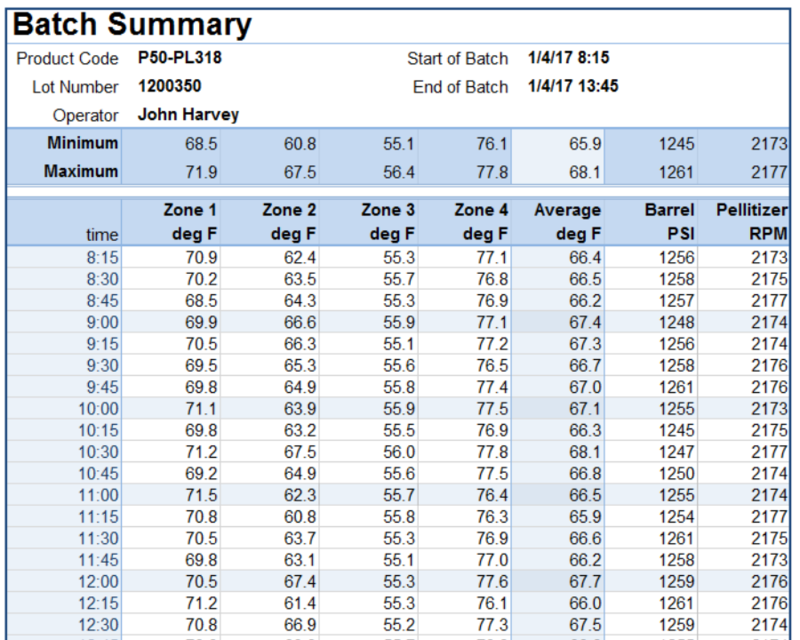 Provide custom report names using fixed text, dates, times and values from PLC registers like the product or machine ID. 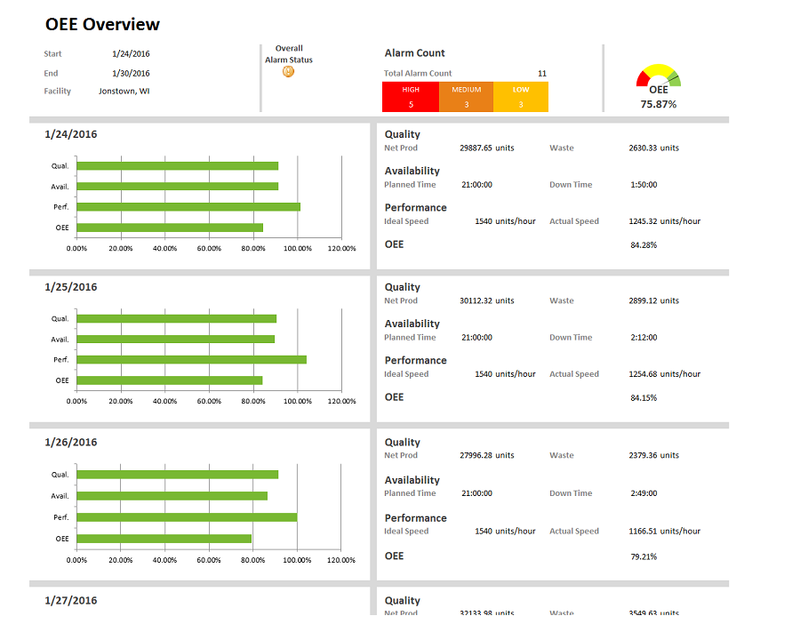 Retrieve raw values, summary values and industry specific metrics directly from the historian. 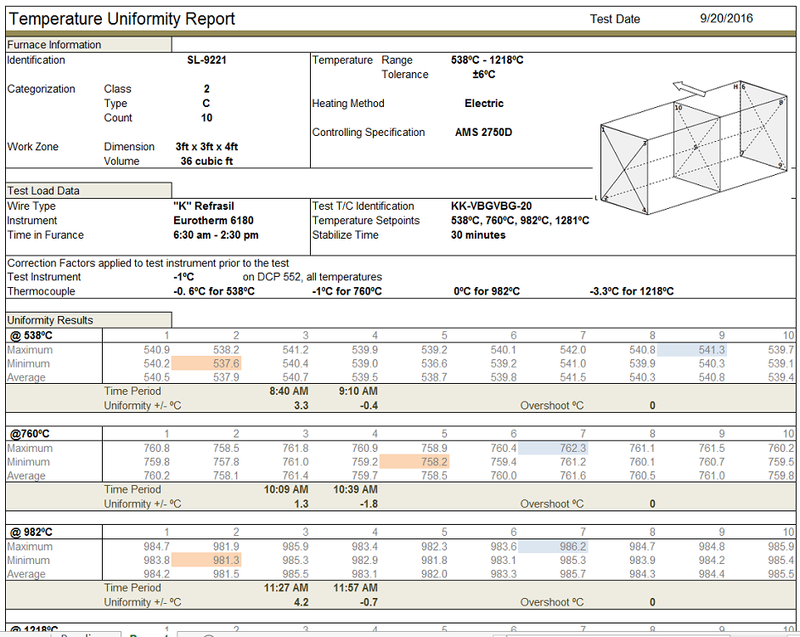 Filter and scale values before they appear in the report. Add supplementary information such as comments and signatures, even to reports actively updating. There are two types of values that can be retrieved from a historian: raw and calculated. Calculated values, such as maximum, minimum, average and total are derived from the raw values. In addition to the standard calculations, XLReporter also provides metrics and KPI calculations to answer process related questions. How many times did the pumps cycle? What is the average temperatures during production? How efficiently is equipment utilized? What are the top 5 occurring alarms? Many data recorders log their data to text files. Examples include Rockwell PanelView Plus, Red Lion controllers, Pro-face touch screens, Yokogawa data loggers and Horner terminals. XLReporter "stitches" the text files into a single entity to produce reports that go beyond the limits of a single file. Easily perform filtering, sorting and scaling. 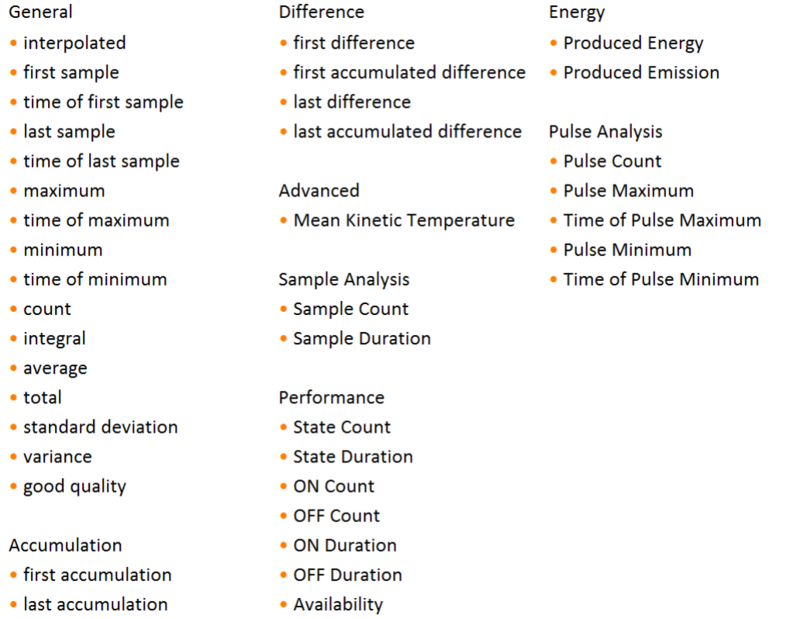 Report on a selection of columns, showing raw values or summary values e.g., the maximum value and the time when the maximum occurred over each hour of a day. Clean In Place (CIP) is a method of cleaning the interior surfaces of pipes, vessels, process equipment, filters and associated fittings, without disassembly. The benefit to industries that use CIP is that the cleaning is faster, less labor-intensive and more repeatable, and poses less of a chemical exposure risk to people. Note the use of chart labels to indicate each stage of the cleaning process. A Thermal Uniformity Survey (TUS) for a vacuum furnace to satisfy AMS 2750D must be performed using established procedures and methods that fully meet the requirements of the specification and allows for consistent and more accurate results of actual furnace capabilities. 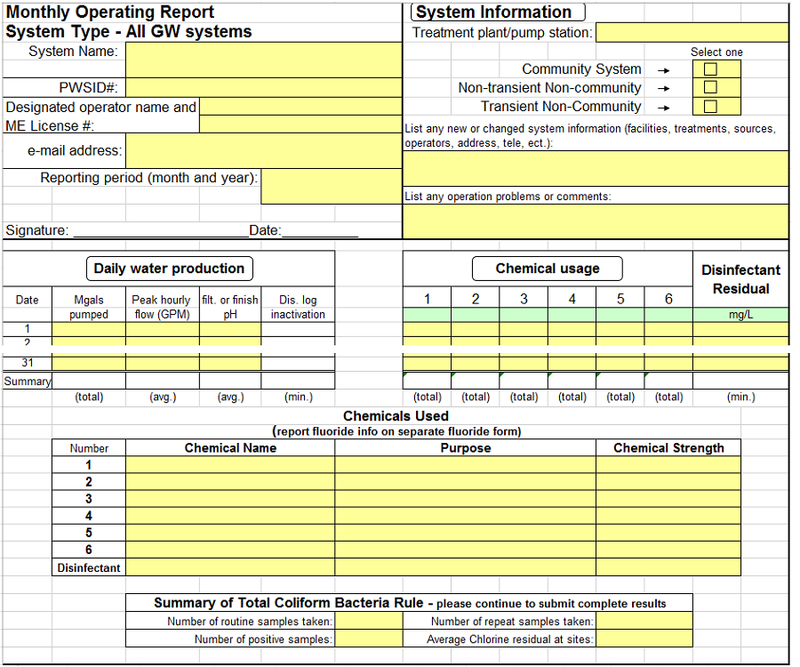 In this solution, the report contains the measurements on one sheet and the final report is on the second. 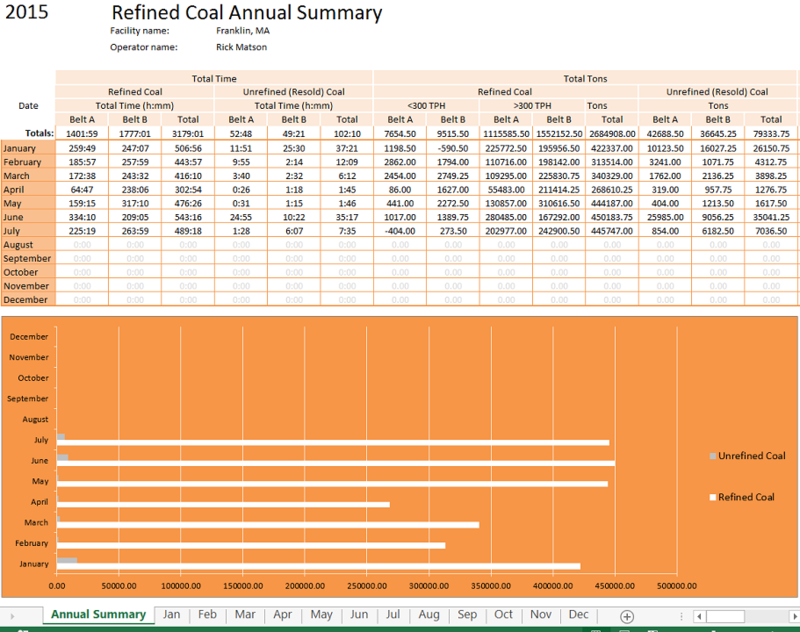 Calculations and formula between the sheets shows how Excel’s capabilities can be easily blended into the solution. Managing energy has proven to be one of the easiest and most cost-effective ways to reduce costs. 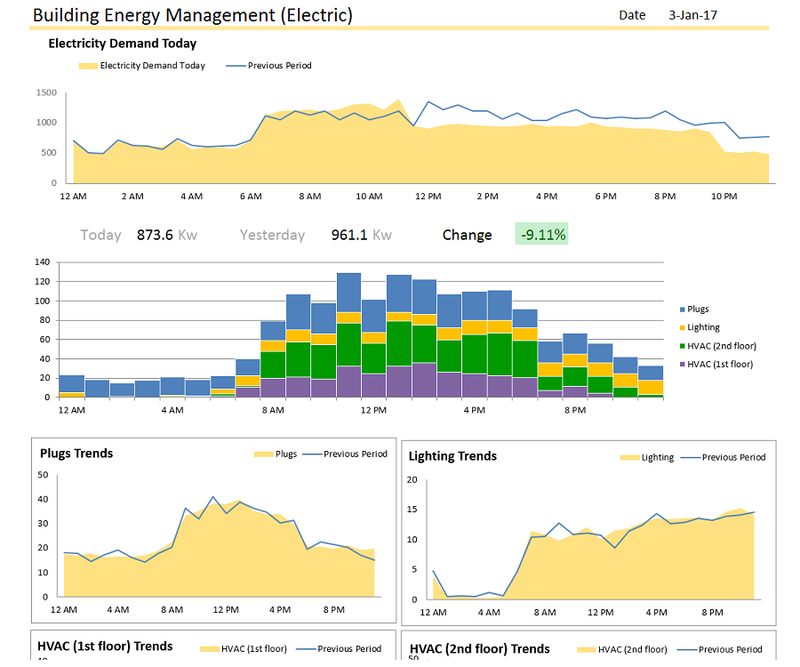 In this solution, data from sensors, meters, utilities and other sources are aggregated to form a complete picture of where and when energy is used. This information will assist in identifying inefficiencies and optimize use. 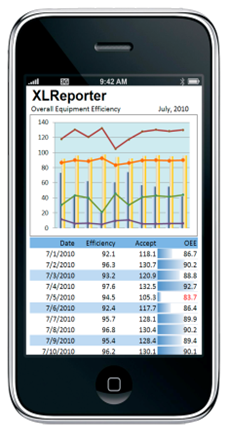 OEE is an abbreviation for the manufacturing metric Overall Equipment Effectiveness. OEE takes into account the various sub components of the manufacturing process – Availability, Performance and Quality. After the various factors are taken into account the result is expressed as a percentage. In this solution, the daily OEE for each production line is calculated automatically and distributed to the supervisors for review. XLReporter is installed in hundreds of Wastewater facilities for two simple reasons. First, the facilities reports are readily available from the Government web site. This means most of the work is already done, no need to "re-invent the wheel". Second, we have acknowledged that manual data entry contributes significantly to reports and software components are provided specifically for this purpose. In this solution the MMR report from the State of Indiana is shown. See also State Of Maine. 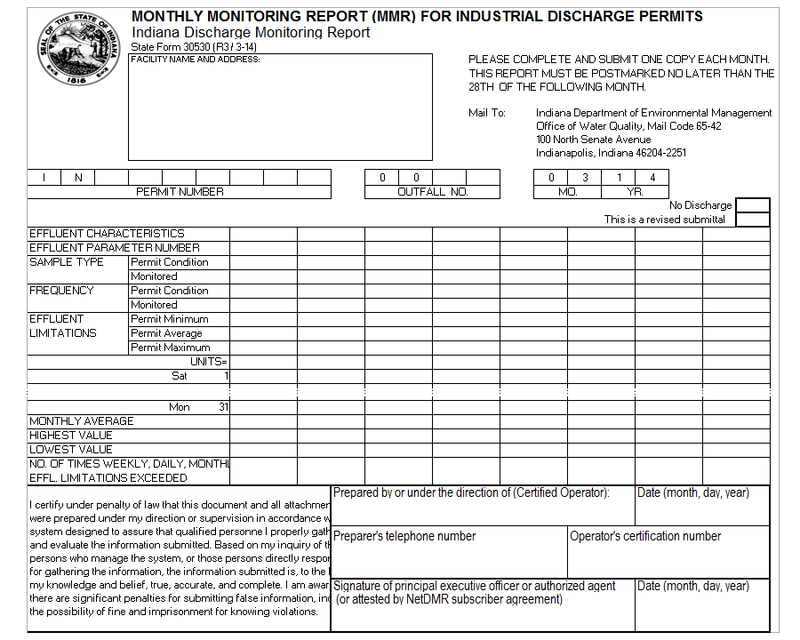 XLReporter is installed in hundreds of Water Treatment facilities since it provides the information Plant Supervisors need to produce their monthly regulatory reports as well as reports for internal use to monitor and improve plant efficiency and reliability. 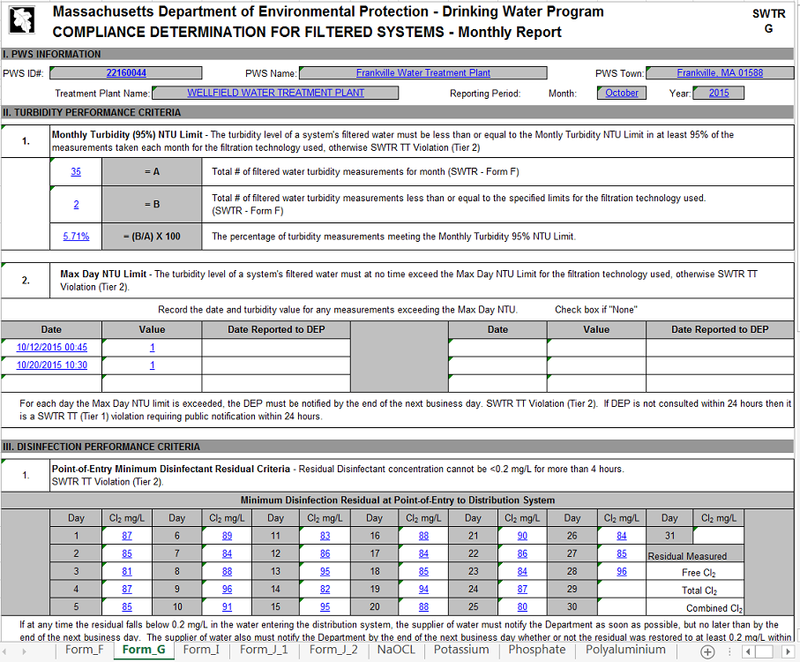 In this solution the Surface Water Treatment Report (SWTR) from the State of Massachusetts is shown. Notice that is consists of multiple reports (tabs). The flexibility of XLReporter collectively satisfies the needs of Regulatory and Compliance reporting and also provides plant personnel with additional in-house information to improve the plant's operation. 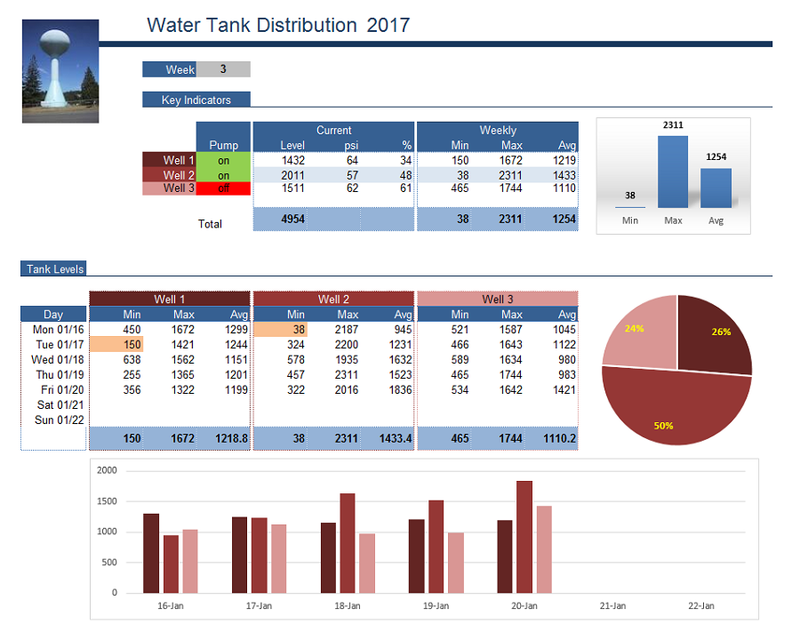 In this solution a weekly dashboard compares the production of three wells. 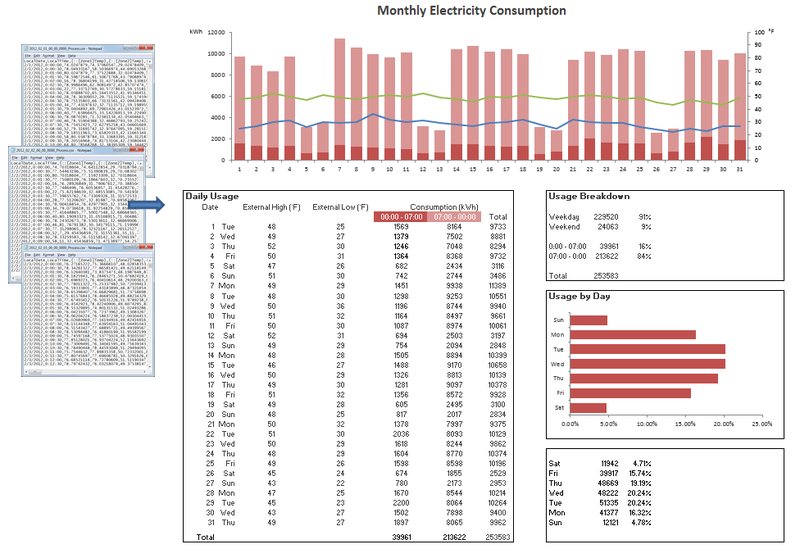 Use of formatting and charts directs the user to data that needs attention. 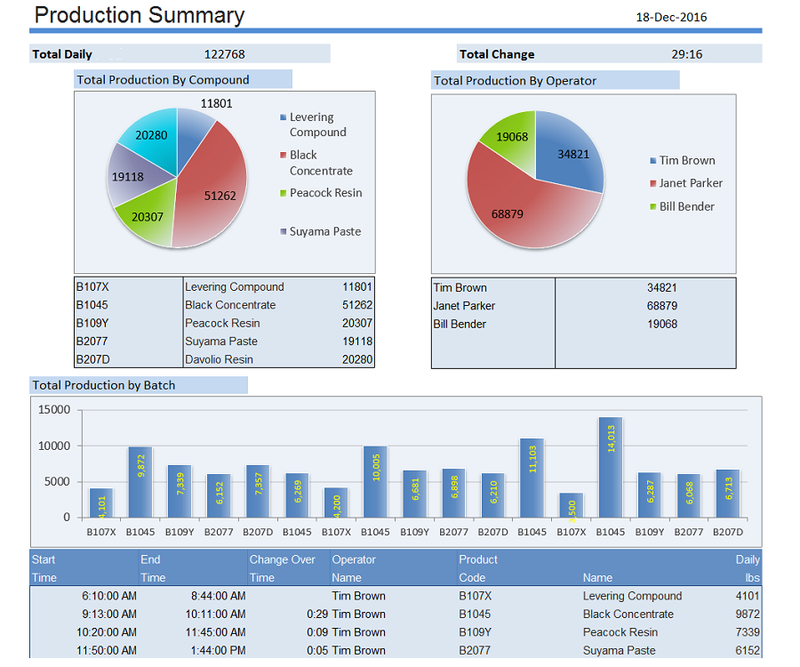 Producing timely production summary reports provides valuable insight into the operation of the production lines and leads to improving product quality. In this solution the production and equipment status for the individual production lines is compared. XLReporter calculates the up-time, down-time and run-time automatically. 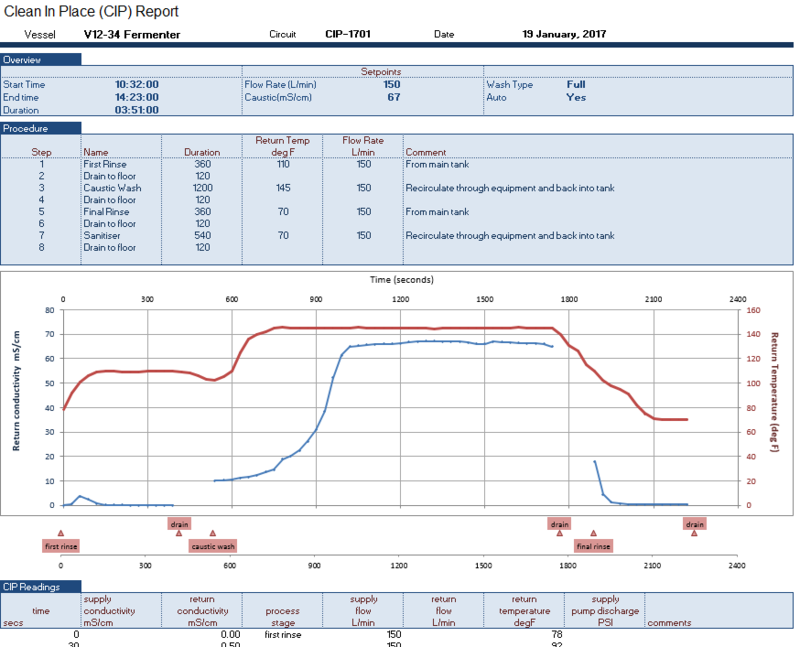 The annual production summary report is an example of a collection of reports that each contribute to a summary report. In this solution the monthly reports are updated each day and the annual summary shows the totals of each month. 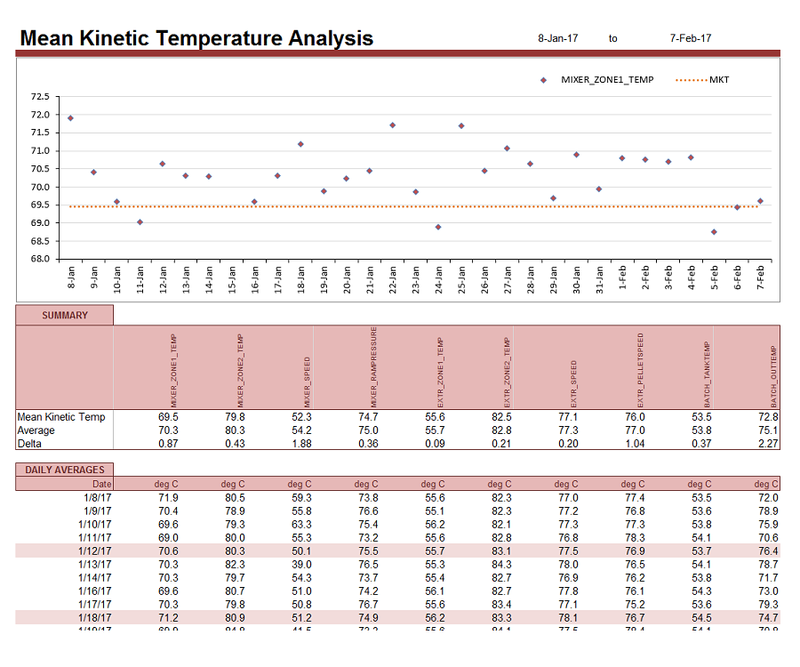 Mean kinetic temperature (MKT) is a simplified way of expressing the overall effect of temperature fluctuations during storage or transit of perishable goods. XLReporter provides MKT as a standard calculation which is widely used in the pharmaceutical and food industries. In this solution the MKT is applied to key process values. A chart shows the distribution of the average temperature about the MKT. XLReporter can capture the relevant timestamps to a database so that they can be used for report generation. Make information available to a wider audience by producing reports viewable in a web browser. In this solution, the reports are automatically produced as web pages and transferred to a FTP server by the built-in FTP transfer tools. By updating the FTP server periodically, users have access to "up-to-date" information at their disposal. See a report from our library at www.sytech.com/mobile on a mobile phone.